Breaking News From Texas: As the shooter, Kelly left the church, he exchanged fire with a local resident, who then used his own rifle to engage him. 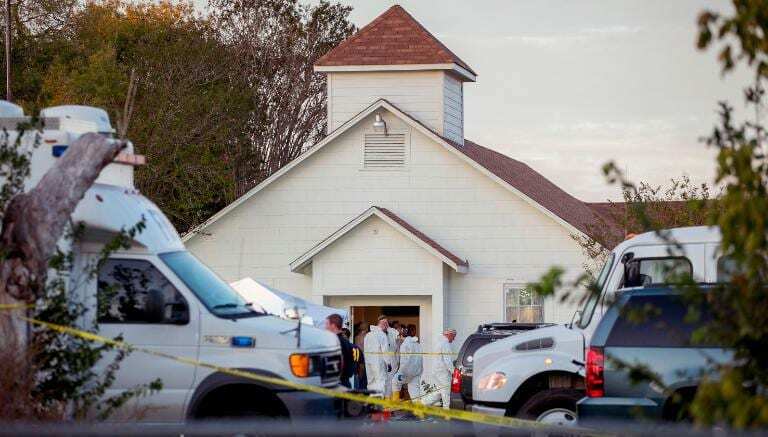 Another horrible attack has taken place in the United States, where at least 26 people have been killed and 20 others wounded after a gunman opened fire at a Texas church during Sunday service. It was all hands on deck as the FBI was on the scene of the shooting, Agents from the San Antonio field office of the Bureau of Alcohol, Tobacco, Firearms and Explosives also headed to the scene. A peaceful town with no history of trouble. According to the church’s website, congregants meet around 9:15 a.m. on Sundays for breakfast before Sunday school and the morning church service at 11 a.m.
After the shooting, about 100 family members of victims gathered in a community centre next to the church, waiting for news of their loved ones. The suspect was seen in a Petrol (Gas) station across the street from the church in Sutherland Springs at about 11:20 a.m. local time on Sunday morning. The suspect left the Petrol station, crossed the quiet street, dressed in Army tactical gear, loaded his gun and began firing indiscriminately leading up to the church and then he entered the church. Where he killed and injured the majority of his victims. The gunman run into the church building and as an eyewitness describes ‘he heard shots and saw people running’. As the shooter, Kelly left the church, he exchanged fire with a local resident, who then used his own rifle to engage him. The shooter then fled the church, while the citizen continued to pursue him. The shooter was killed after a brief chase north into neighbouring Guadalupe County. A law enforcement later found the suspect dead of a gunshot wound inside his vehicle. And it has not been confirmed who killed the home grown Terrorist, Devin Patrick Kelly. After the shooting, and as police presence intensified at least a 100 family members of victims gathered in a community centre next to the church, waiting for news of their loved ones. Others later joined holding vigils and holding hands whilst praying for the victims. Local community leaders and pastors from other churches also arrived on the scene to help console and support the victims and community. Local hospitals are treating the victims with priority care and have advised that most of the injured are stable except one, who remains in critical condition. President Trump tweeted whilst on his Asia trip. And later released this statement. Questions will be asked again about the countries relaxed gun laws, following the second shooting in as many months in the United States, with the country still reeling from the Las Vegas shootings. And quite a few commentators have noted that they are looking to see if the President treats this shooting with same severity he did with New York attacker.